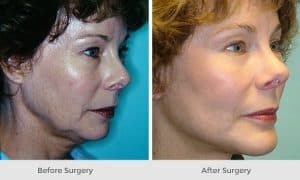 Ablative laser skin resurfacing is one of the most effective cosmetic procedures for improving aging skin. The procedure works by delivering an intense wavelength of light to the skin, which removes the outer layers of aged or sun damaged skin. With advances in laser technology, it is now possible to significantly improve aged or sun-damaged skin. Ablative laser skin resurfacing is one of the most effective cosmetic procedures for improving aging skin. Fortunately, this treatment is available in the clinic of Top Skin Doctor in Islamabad – Prof. Dr. Ikram Ullah Khan. The procedure works by delivering an intense wavelength of light to the skin which removes the outer layers of aged or sun damaged skin. In addition, the laser stimulates the underlying skin, resulting in collagen formation and an improvement in wrinkles. As the laser skin heals following the procedure, new skin forms that is smoother and tighter. Liver spots or age spots. It is important to note that laser resurfacing cannot remove deep wrinkles or excessive or sagging skin. In addition, the effects aren’t permanent because as you age, you continue to develop wrinkles. Repeated treatments may be necessary. The fully ablative CO2 laser was introduced in 1968. With time, it became the original gold standard for improvement in photoaging. 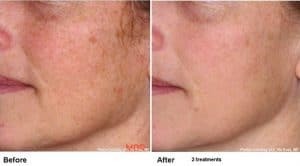 The CO2 laser emits monochromatic light with a wavelength of 10,600 nm, which is highly absorbed by water and results in ablation of the epidermis and part of the dermis. Er:YAG 2,940 nm was the next big thing after CO2 as a fully ablative option. It promised fewer side effects and faster healing. A shorter wavelength laser, Er:YAG emits light at a wavelength of 2,940 nm, which more closely approximates the peak absorption of water (3,000 nm). Er:YAG lasers produce inferior skin tightening than CO2 lasers when the fluence and number of passes used are comparable. What to expect from the procedure of Ablative Skin Resurfacing? Laser skin resurfacing targets the outer layer of your skin while simultaneously heating the lower layers in the dermis. This will promote collagen production. Ideally, new collagen fibers will help produce new skin that is smoother in texture and firmer to the touch. Before laser skin resurfacing, your doctor will prepare your skin for the treatment. This involves a series of treatments done several weeks prior to the procedure. The purpose is to increase your skin’s tolerance to professional treatments. It can also decrease your risk for side effects. On the day of the procedure, you doctor will apply a topical anesthetic to the area being treated. This will help in reducing pain and make you more comfortable during the procedure. If a large area of skin is being treated, your doctor may suggest a sedative or pain killers. Next step is to cleanse the skin to remove any excess oil, dirt, and bacteria. Your doctor begins the treatment, using the selected laser, then moves the laser slowly around the designated area of skin. Finally, your doctor will dress the treatment area in wraps to help protect the skin at the end of the procedure. Like other cosmetic procedures, laser skin resurfacing does pose the risk for side effects. You can consult Prof. Dr. Ikram Ullah Khan – Top Skin Doctor in Islamabad for more details about this procedure.